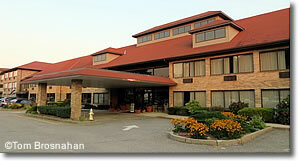 Middletown RI has many less expensive highway hotels along the roads leading to Newport. Stay here and you're only a few minutes' drive from the center of Newport. Newport RI occupies a relatively small area at the southern end of Rhode Island (the actual island of that name), with Middletown RI, a separate municipality to the north. Middletown is not as burdened with historical buildings as Newport, so there's more room for modern commercial development, including highway hotels, successors to the motels of yesteryear. Highway hotels are simple, modern hotels with at least basic services, standard comforts and moderate prices—about half what you'd pay in Newport proper. If you approach Newport from the northeast, coming from Boston, Cape Cod or Fall River MA, you'll pass right through Middletown on your way to Newport. Near the intersection of RI Routes 114 and 138, 2.2 miles (3.5 km) northeast of the center of Newport (map), are several good highway hotels in a commercial district of shopping centers and auto dealerships. It's not romantic or historic here, but the prices are advantageous. Clientele includes officers from the nearby Newport Naval Complex. RIPTA Bus 63 runs between this area and the Newport Gateway Center in downtown Newport. Also, some hotels here have shuttle service to the center of Newport. A simple but filling breakfast is normally included in the rates. The 3-star, 95-room Hampton Inn & Suites Middletown is perhaps the best among these, featuring an indoor swimming pool and whirlpool, fitness room and business center. Chain restaurants are within walking distance. Just across the RI Route 138 is the 2-star, 114-room Howard Johnson Newport Area/Middletown, with good facilities: refrigerator and microwave oven in the rooms, an indoor pool, hot tub and sauna, fitness room, and laundry facilities. Also here is the 3-star, 97-room Residence Inn Middletown, a step up in services as it features an indoor swimming pool, gym, sports court, barbecue facilities, a bar with video games, full buffet breakfast, and suites including full kitchens with dishwashers, and sitting areas with a sofa bed. The 3-star, 131-room Ramada Middletown is a bit farther north but still convenient, with its own restaurant and bar. Even cheaper? Go just a bit farther north to the 2-star, 120-room Quality Inn & Suites. A few other highway hotels are located just north of Easton's Beach (First Beach) on RI Route 214, Valley Road, 2.2 miles (3.5 km) east of the center of Newport. Because these lodgings are close to the beach, rates may be a bit higher than at the highway hotels mentioned above. The 2-star, 40-room Knights Inn is the bargain here, the 2-star, 43-room Atlantic Beach Hotel & Suites is even closer to the beach, the 3-star, 55-room Comfort Inn at Atlantic Beach is a step up in quality, and the 3-star, 68-room Newport Beach Hotel & Suites may be the most comfortable in this area. 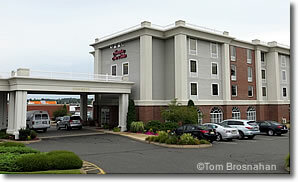 Hampton Inn & Suites Middletown RI.